The Sierra Nevada has always been known for its deep snowfalls. One of the big winters in early Truckee history was the winter of 1873-74. While the Central Pacific Railroad was being built, the winter of 1867-68 was noted as being a heavy winter, and 1873-74 was compared to it. The Truckee Republican reported on the snowstorms and its effects in a series of articles. Due to the snow, there wasn't a lot of other news to report. Huge snowplows were needed to keep the Central Pacific Railroad open during the winter of 1874. Plow # 2 is shown in Truckee waiting for the next storm. The fall of 1873 started out wet. By September, houses were in short supply as loggers moved in early from the woods for the winter. During mid- December, the Republican was hard pressed to find any fights, shootings or crime to report due the snow. The stage and freighting routes to the Sierra Valley and to Hot Springs (Brockway) were closed to wheeled vehicles by December 8. The teamsters and stagecoach operators took their wheels off and put on sleigh runners. They put snowshoes on their horses and packed the roads and traffic continued to move. A series of storms struck in December. The first snowstorm lasted 54 hours, the second one 48 hours, the third storm 16 hours, the fourth one 32 hours, and the fifth storm lasted 15 hours. The lower areas of Truckee and Lake Tahoe had five feet of snowfall. Lake Tahoe rose 6 inches. Another round of storms in January started to cause problems. Business in Truckee was sluggish and money, always scarce in winter, became even harder to come by. The snow opposite the mouth of Martis Creek had drifted to a depth of ten feet. On January 20, the stage line of Penman and Day, with its experienced driver, M.T. Sullivan was stopped on its trip from Truckee to Sierraville. Just past Prosser Creek, the snow became too deep, and Sullivan was forced to return to Prosser Creek House and leave his team of horses there. Four to six feet of fresh snow had buried the Sierraville route. The road had been marked with snow stakes but many of them were buried. A brigade of road breakers reopened the road with 13 horses and eleven men. It took seven days to accomplish. At the time all supplies and passengers to the Sierra Valley came from Truckee. The Central Pacific struggled to keep trains moving and succeeded. 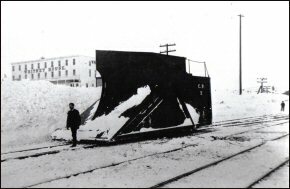 During most winter storms, only two engines were needed to propel the wedge shaped snowplow through the snow. During the January storms four engines were needed to keep the tracks clear from Truckee to Reno. Six engines were needed to keep trains moving over Donner Pass. Several times the engines were derailed. By using jack screws and muscle power, the engines were put back on the tracks. Heavy winds, compared to an "unchained hurricane" accompanied these storms and the snow was dry light powder, which created huge drifts. The railroad had built wooden snow sheds over the tracks just for these kinds of storms. The sheds were put to the test and survived, allowing trains to continue operating with little delay. The Central Pacific snowplow superintendent, Nate Webb, who had been battling the Sierra Storm King for seven years, declared he had never seen such a furious storm. The hardy, courageous men who worked long hours were rarely given much publicity, except in heavy snowstorms. The January storms piled up heavy snow, much of which had to be hand shoveled. The men were only seeing a taste of what the Sierra could offer. On January 24, 1874, the temperature in Truckee dropped to 30 degrees below zero, freezing everything up tight. Firewood, buried by deep snow, was hard to find and theft of wood became a problem. The middle of February brought another huge storm, one that was described as the wildest, fiercest, stormiest nights ever known on the railroad. Orders came to stop all freight trains, keeping just passenger trains and snow plows running. The 30 ton wedge snowplow was pushed by six 40 ton engines, and men stood on top to shout orders to the engineers. tracks in an hour and a half. In Coldstream Canyon, a slide had covered the tracks ten feet deep. The snowplow shuddered and heaved, but the smoking, shrieking, fiery demons, with steam up to their full capacity pushed their way through at thirty-five miles a hour. Dashing through tunnels that had huge icicles hanging from the roof, through snow sheds with countless tons of snow on top of them, the train roared on. In some places, avalanches of sixty feet of snow were on top of the snow sheds. Twenty inch timbers, four feet apart of Truckee pine and fir were all that separated the brave railroaders and death. The cost of $75,000 for a mile of snow shed was worth the cost in this storm alone. The most experienced, bravest, coolest, most skillful engineers and firemen on the Central Pacific were assigned to snowplow duty. At times they worked four days straight to keep trains moving. Men like Engineer Thomas Forsythe, Master Mechanic M. W. Cooley, and Superintendent Nate Webb could have chosen easier duty in Sacramento, but they bravely placed themselves in the heart of the battle with the Storm King. The Truckee snow plows turned around at Summit Station. The west slope snow plows operated from Blue Canyon to Summit Station and had more miles and deeper to snow to contend with. During this February storm, the Central Pacific had four snow plows and fifteen engines battling the snow over the route. An additional 500 men were employed repairing tracks, snow sheds, telegraph lines, and shoveling snow in the ninety mile snow belt. In this storm, a passenger train was stuck in the snow a mile below Emigrant Gap. Adding an additional engine, the Truckee snowplow raced down the mountain to the rescue. Seven engines pushing a plow were stopped dead in its tracks by a snow slide. One hundred men and fourteen engines were quickly able to free the plow train and passenger train. The storm having ended, the Truckee plow returned to Summit Station. On the way the plow derailed, crashing into a snow shed. The timbers snapped and broke, almost bringing the roof down on the engines. To make matters worse, the passenger train had been closely following the plow train, and it ran into the stopped train. Since now seven engines were stopped in the snow shed, the smoke was so thick that everyone was choking on the smoke. Three of the engines were crippled so badly they had to be abandoned. No lives were lost, but several engineers were injured. Three hours of hard labor were required to put the plow and engines back on the track. Extra engines were brought up from Blue Canyon, and the railroad was open for business again. The trip back to Truckee was a quiet one, in bright sunshine compared to the raging blizzard of the night before. March came in like a lion. On the third, snow descended with a blinding fury. The Central Pacific snow plows went back into battle. Regular service was again stopped. A push plow and 5 engines, boring it's way through the drifts, ran off the tracks between Blue Canyon and Emigrant Gap. Superintendent Nate Webb led 120 men who worked eighteen hours straight to free the engines and get them back on the tracks. A daring feat was required to reopen the tracks. Two to three feet of snow had piled on the tracks, and more was falling. Four of the engines were still off the track, one engine with the snowplow in front was needed to get to Blue Canyon where three other engines waited. The steam pressure was cranked up full blast. There was one hundred feet of clear track and then deep drifts. The throttle valve was thrown wide open and the roaring engine struck the drifts. Snow was thrown fifty feet in the air, with the lookout on top of the plow, signaling to the engineer. For almost three miles the single engine kept up full speed, with certain death waiting if the plow jumped the tracks. Engineer Thomas Forsyth had been told to make Blue Canyon or land his engine and plow in the American River Canyon. It took three minutes, then the good news was telegraphed back that the engine had made it. The four engines then returned and pulled the derailed engines back on the track. The eastbound trains were delayed about twenty hours. A freight train had also became snowbound in deep drifts in Strong's Canyon, above Donner Lake. The engines were forced to detach and forced their way to Truckee. Three more engines with a snowplow went to the rescue. It took several hours to dig out the train and bring down the train and reopen the tracks. Donner Pass was not the only problem for the railroad. A snowplow, three engines, and a large number of freight cars were thrown from the tracks in eastern Nevada near Winnemucca. Throughout the western U.S., people were becoming very tired of the snow. Even though stage operators had switched to sleighs, they were still losing the battle. M. T. Sullivan, on the Sierraville run was twice forced to abandon his sleigh. Sullivan and his passengers were forced to ride the horses to safety. It took them two days to travel from Truckee to Sierraville. Another huge episode of the Storm King descended on the Sierra on March 8. The men, engines and plows were now becoming fatigued. Within one day the rail line was blockaded and all trains stopped. For a time all shoveling and plowing were stopped. On the ninth the snowplow and six engines steamed up and headed up the grade. Almost the whole town turned out to cheer them on. A Truckee Republican reporter went along for the ride, mostly on top of the massive wedge plow. Two miles from Truckee, the engineers discovered that one of the engines had broken a wheel. The plow train stopped while a new engine came up from Truckee. Meanwhile the snowstorm continued to pile up deep drifts. About four miles from Truckee, the train struck a deep drift and came to a halt, stuck in the snow. The track crew shoveled out the engines, separated each engine, recoupled and backed up a half a mile. With full steam, the train struck the drift again at 40 miles an hour, and made one hundred feet of progress. Again and again the plow train bucked into the drift, making scant headway each time. It took seven tries to clear the tracks. They made good time to Coldstream siding where wood and water was taken on. Again the train started, now pushing into deeper, but dryer snow. The powder now flew from the plow, up to twenty-five feet in the air. In Strong's Canyon, above Donner Lake, the plow derailed. The crew skillfully jacked the plow back onto the track and continued on. Finally, Summit Station was reached, where the train was turned around and headed back down the mountain. The snow continued to fall, but the blockade was raised. Due to this savage winter and the many blockades, the railroad began designing and building bigger snow plows and more powerful engines. More snow sheds were planned to cover the tracks as well. The townsfolk in Truckee dealt with the snow. Although it was only five to eight feet on the level, snowdrifts and piles from shoveling the roofs built up twelve to twenty feet. Tunnels were dug to get into some buildings, in others ramps were built to get down to the doors. Even in broad daylight, lamps were lit all day. The roof on Fred Burckhalter's general store on Front Street caved in because of the heavy snow load. The teamsters and stage men battled to open the roads to the Sierra Valley and Lake Tahoe. Lacking the steam power of the railroad, the work was done with horses, packing the roads as they went. Twelve inch diameter snowshoes were placed on the horses hooves, and away they went. The cattle and livestock in the Sierra Valley were short on feed, and wheat and flour were running low. It took over week to get enough supplies to the valley to prevent a disaster. The road breakers had no shelter, so they had to travel twenty or more miles to reach safety. Frequently overtaken by darkness or blinding snow, they had to face the Storm King head on. They risked their life to keep stage and freight traffic moving through the worst of storms. Most winters, loggers would welcome the snow, as they fell trees, packed roads, and hauled sleigh loads of logs to the sawmills or the banked them on the rivers. This winter, the snow was so deep that no logging could be done. The ice harvesting at Boca and Prosser Creek was also slowed, as the snow had to be scraped of the ice. The snow pack on the crest of the mountains had reached 30 feet, buildings were buried and there was no place to put more snow, if it fell. The exact total wasn't officially recorded, as the railroad didn't start keeping records until 1878. Fortunately, winter was over and the snow began to melt. But the runoff from the snow pack caused problems for several months. In May the high runoff carried away a 30 foot high trestle on Prosser Creek. All of the rivers and creeks had very high water. Trout Creek overflowed into Church and Bridge Streets every day for several weeks in May. Many of the bridges on the Dutch Flat and Donner Lake Wagon Road were crushed by the snow and wagon traffic was delayed. In early June the horses on the stagecoach to the Sierra Valley were still using snowshoes. As runoff peaked in July, Bragg & Folsom's dam on Prosser Creek partially washed out. The level of Lake Tahoe rose so high that lakeside ranchers had 2,000 acres of pasture flooded. The dam at the outlet was still closed because the Truckee River was close to flooding. The lake was three feet above the low water mark. While other winters in the Sierra have been worse, this one was bad enough that it was remembered for many years. For several decades the railroad was able to keep the tracks open with few delays such as they experienced in the winter of 1873-74.